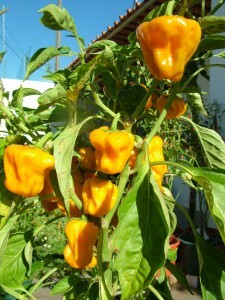 Very compact, densely foliaged plants bear an abundance of bright yellow or red, thin-skinned hot peppers that are shaped like a tam o’ shanter. Actually a type of squash pepper. Interesting shape and spicy taste make this pepper good to eat fresh, pickle, or use as a garnish. 95 days.